A senior expert, working with the powerful Reliance Industries Ltd (RIL)-run think-tank has said that the top Germans businessmen who had accompanied German Chancellor Angela Merkel to India early this month have outspokenly declared that Prime Minister Narendra Modi has done little to “ease” business environment in India. The expert, Britta Petersen, who works as senior fellow with the Observer Research Foundation (ORF), quotes Wolfram von Fritsch, Chairperson of Deutsche Messe AG.that Modi had raised “huge expectations” with his 'Make in India' campaign earlier this year at the Hannover in Germany, but “half a year down the line it seems that not much has happened to ease business in India". Ahead of the German chancellor's vist, a survey by the Indo-German Chamber of Commerce (IGCC) on hindrances of doing business in India in 2015 lists bureaucracy (58 percent), lack of infrastructure (52 percent) and corruption (45 percent) as the main obstacles for companies, followed by tax disputes (32 percent) and lack of skilled people (35 percent), which ORF expert cites to point towards may have gone wrong. According to the ORF expert Fritsch as also others in the 30-head strong German business delegation, who brought forward their grievances in the meeting that was jointly organised by the Federation of Indian Chamber of Commerce and Industry (FICCI), Confederation of Indian Industries (CII), IGCC, and the Asia Pacific Committee of German Business. “Slower economic growth worldwide and a less bullish outlook on India led to a slow-down of the annual trade volume between the two countries. Instead of cracking the much awaited 20-billion Euro mark, it is staggering around 16 billion Euro this year”, says the expert. “This is all the more regrettable since Germany as one of the leading economies worldwide can play a major role in making Modi's 'Make in India' campaign successful. 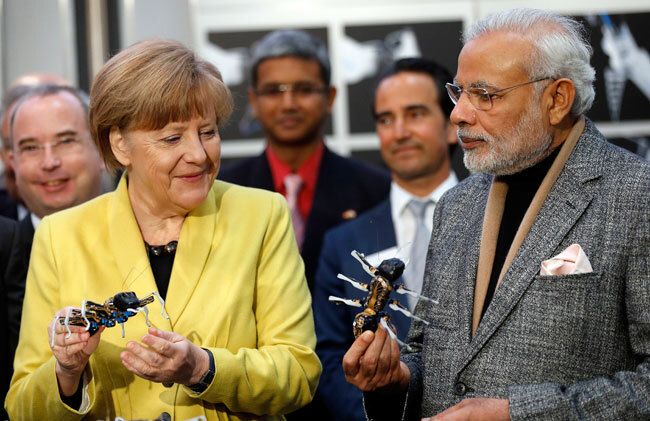 During the last ten years, German companies have invested more than five billion Euro in India, while Indian companies invested four billion in Germany, conversely”, adds the expert. The expert quotes Hubert Lienhard, Chairman of the Asia-Pacific Committee of German Business and CEO of Voith, a family-owned mechanical engineering company to say, "At the moment my own company has 20 percent more capacity than we need in the country. I hope that we will meet again here in one year and all the plans of the Indian government have been transformed into action. Then we will continue to invest." Others had a similar view: Catharina Claas-Muehlhaeuser, who heads the Board of Directors at Claas, one of the world leading producers of agricultural machines, says, "Without infrastructure we will leapfrog nowhere". Adds Siemens CEO Joe Kaeser, says. "Everywhere in the world you have to develop energy and infrastructure first, then comes industry". “Siemens has been in India for almost 100 years and Kaeser had travelled to India five times this year because his company wants to sell technology for smart cities on a large scale.”, the expert says, quoting him further as saying, "Making one single project work is better than any talk."